Friends: Megavolt, Bushroot, Liquidator, Keleen Vanderchill, Steelbeak, Malicia, Marty Mcfly, Launchpad, Brogan (occasional babysitter when younger) and many, many others. Enemies: Several members of the St. Canard District Attorney staff. 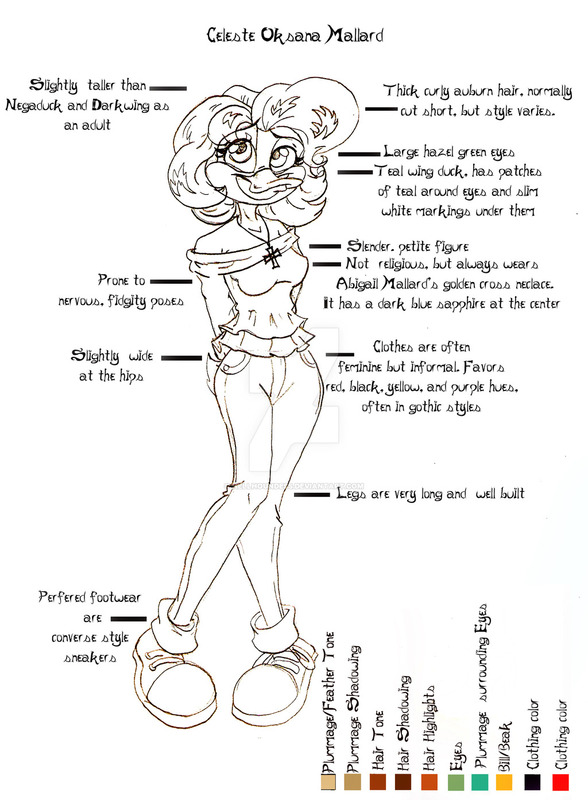 Appearance: Auburn hair, medium length, hazel green eyes, light brown plumage with teal patches around her eyes and white marks underneath. Usually wears dark clothing that ranges from fashionable dress suits to worn in jeans a a black tank top. Super powers (if any): Does extreme charm and ability to win over the judge count? Weaknesses: Too soft-hearted. She’s often caught between her grandfather, Jake Mallard, her Father, Negaduck, her friends, the Fearsome Four, and her “Uncle” Darkwing in wanting to do what makes everyone happy. Slow to anger but a real fireball when she gets angry. She’s refined but not too much to jump into a fix fight. She loves horror movies and has a slight weakness for British accents. Also a devoted animal lover. Stowed away in the Troublemaker when she was a young duckling at age 8, escaping the orphanage Negaduck himself lived in as a youngster. She was adopted by the Lord of the Negaverse, but they were seperated soon after when Darkwing Duck destroyed the Universal Portal until she was 13 years old and was transported into Darkwing’s universe and reunited with her father. Thereafter she formed a close friendship with most of the Fearsome Five, particularly Quackerjack whom she fell in love with. She is currently one of the lead criminal defense attorneys in St. Canard and represents the Fearsome Five in court as well as several F.O.W.L. agents.